The Legendary Estonian Liqueur Vana Tallinn Has a New Look ! 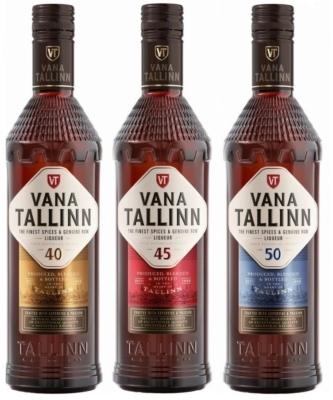 The most popular Estonian liqueur Vana Tallinn has a new label that as of now distinguishes even more clearly the three different strengths. Compared to the previous design that lasted almost a decade, the front of the bottle now contains more information about the drink. “The Vana Tallinn liqueur is a world-renowned Estonian brand, which is more and more growing in popularity in foreign markets. A desire to give extra value to this unique brand, to make it even more international and prominent, was the reason why the legendary drink will welcome the customers in Estonia and all over the world in the new year with a renewed look,“ said AS Liviko Chairman of the management board Janek Kalvi. The new design is characterized by a metal glow and a shade referring to the strength: Vana Tallinn 40 is golden, Vana Tallinn 45 is red and Vana Tallinn 50 is blue. The panorama of Tallinn remains on the label, which was stylized by graphic artist Kaisa Puustak in the 60s on the basis of the gravures of Tallinn from the 17th century. Designers from the French agency Appartement 103 that have previously worked with several internationally known premium brands were involved in the creation of the new exterior. The content of the liqueur remains unchanged. Vana Tallinn is liqueur made of solely natural ingredients that binds Jamaican rum, hand-made vanilla and cinnamon extracts and natural citrus oils together into a spicy taste experience. By now, 55 years have passed from the creation of Vana Tallinn by Liviko’s liqueur crafters. Vana Tallinn is the best known Estonian liqueur in the world that sells over 2 million bottles a year in 27 countries. Over a half, 60% of this legendary drink is sold in foreign markets to be more precise. The first bottles with the new labels were completed in December and will reach Estonian trading network in the first half of 2018. A Gallery of the products with the new label you may find here and a production video from here.